The Royal Challengers Bangalore were asked to bat first by Mumbai Indians in Monday’s match, and they could only post 172 runs on the board. Mumbai had a tricky chase ahead of them, but the openers Rohit Sharma and Quinton de Kock made it rather easy for the middle order, scoring 70 runs in the first seven overs before both of them got dismissed. RCB had bowled a few loose deliveries, which eventually took the game away from them, and Hardik Pandya acknowledged that before crediting his team’s opening duo. “Fantastic victory. Lucky with the start we got. Hats off to both the openers. It was not easy to bat on this wicket but they made it easy for us in the end. I felt RCB didn't bowl well in the powerplay and that's where I thought they lost the game,” expressed Hardik, at the post-match presentation, reported PTI. On the other hand, the Mumbai bowlers had started extremely well in the first innings sending back Virat Kohli in the third over itself, while Parthiv Patel was not very far as he returned in the seventh over. 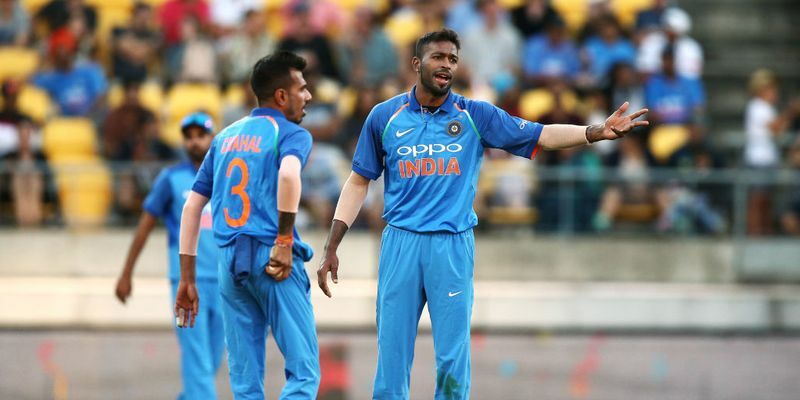 Jasprit Bumrah and Jason Behrendorff ensured that they generated bounce off the wicket to tie the RCB batsmen to the ground, and Pandya was all praise for them. “We began well and had the bowlers who hit the deck hard and got some purchase off the wicket,” the 25-year-old said. The pitch at the Wankhede behaved differently as was evident when AB de Villiers had started his innings, for he could only manage 19 off 21 balls. However, Moeen Ali, who scored 50 off 32 balls, and De Villiers, who ended up at 75 off 51, managed to stitch a 95-run partnership that ensured that RCB would post a fighting total. Pandya lauded their batting given the fact that the wicket was tricky. “The way the wicket started playing, even AB found it difficult but they both (AB and Moeen) played well,” stated the World Cup-bound India player. The three champions have won five of their eight matches until now, and the all-rounder hoped that their momentum continues. “It's always good to win at home. We are on the road and hopefully we can continue the winning momentum,” concluded Pandya. Post the fine start by Mumbai, RCB had managed to make a comeback in the game with a few wickets. The equation had come down to 22 required off the last two overs when Pandya and Pollard were at the crease. Both were right-handed and Kohli had handed over the ball in the penultimate over to slow left-arm spinner Pawan Negi. And that proved to be costly as the target was chased down in that very over. Kohli justified his strategy but was disappointed that it did not click. “At the end, we had to take the risk with the left-arm spinner, with two right-handed batsmen. Giving pace was risky, especially with a bit of dew. Unfortunately, it didn't come off,” stated Kohli. RCB’s playoff hopes are more or less over, as they are now placed at the bottom of the table with just one win in eight games. However, the skipper was happy with the team’s performance in Monday’s game, and the one against Kings XI Punjab on Saturday, which was their first victory of the season. “(In the upcoming games) We just have to enjoy ourselves, play the way we did in the last two games. Need to keep our composure under pressure. Need to take half-chances,” the skipper signed off.